Family Starts Here: LOVE A KID! So a while back, we had a pilot program with a local agency, to certify families and help them find waiting children. One of our families was matched with a young girl in Nevada and the other day, I had the pleasure of meeting little miss Lacy. She was adorable and sweet and I'm so happy for the family. The adoption will finalize in a few weeks and our office couldn't be happier. 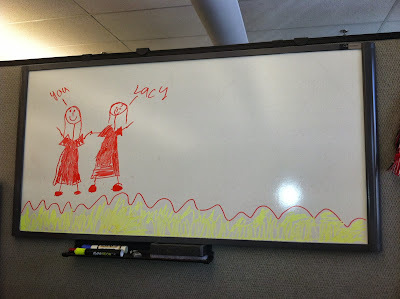 As for me - I got a sweet Lacy original on my dry erase board...yay for awesome kids!